Here is an interesting article on Resistant Starch with a lot of references to actual research for anyone else with a curious mind and a Ted Talk video that pretty much summarises some of the key research explained in the book. Enjoy. Amazing the difference knowing the ‘whys’ makes! (No, that’s not a criticism – I think we all do it to a certain extent – don’t give all the details because we’re replying to something/posting something on a forum.) Yes, I can see that being in hotels might pose problems, at least when I go to Germany there’s always plenty sauerkraut around! My other diet-and-fitness guru, Leonard Morehouse, said that the best diet anyone could follow would be to eat as wide a variety of foods as they could get their mitts on, but moderation in all things. Even 40 years down the line, his advice not only still holds good, but appears to be confirmed by modern dietary thinking, at least, the thinking of folk like Michael Mosley, not the clowns who dream up faddy diets for the gullible! And I didn’t fully answer your previous question re potato starch: yes, it is still working! Not only that, I forgot to take it last night (didn’t realise until I got up and found the still-clean glass!) and had a simply dreadful night, far and away the worst I’ve had since starting. Just google “microbiome sequencing service in australia” ? Tried that but for UK. Got loads of results with most seem to be suggesting ‘pay money and discuss the results with your nutritionist’. So far as I can see, none do the same as the Weizmann people and suggest which foods to eat or avoid. Yes, I believe the service is only available in the UK and USA and a paid service. I don’t know any free ones. The Personalised Nutrition Project has been licensed to http://www.daytwo.com. It is only available in the US ($299) and Israel. They say they are going to expand to other countries. Dietetics/ nutrition is a specialised field; tailored advice needs to consider the individual. Age, gender, lifestyle, current diet, diagnosed medical conditions, prescribed medication, etc, etc. Avoiding or increasing one food type can throw the balance of several nutrients off, necessitating adjustment in other areas of the diet or even supplementing. Similarly the lab work in sequencing the microbiome requires expensive equipment and the time of skilled technicians. For anyone who can’t afford or justify the cost of personal advice – inc. me! 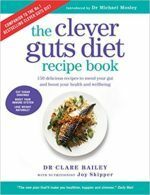 – next best is reading the Clever Guts Diet and other books by the experts from the American and British Gut Projects. Getting the gut microbiome sequenced is not a short cut or fast track to better health. Ultimately we would still need to overhaul our diets, and measure success by improved symptoms. To use changes in the microbiome as a measure of success means budgeting for regular testing. I agree with you Firefox7275: it is a specialist field. That said, without the mapping , you are steering blind. While the advice in Michael’s book is excellent it is simply not possible to say what is a good diet for any one individual without knowing anything about your microbiota. I’ve just sent off my own sample for this reason and I’m awaiting the results with interest. One of my Israeli friends had her microbiome mapped by DAYTWO. There is no way you could have predicted what the results would be without the mapping – the outcome is often not what you expect. I would like to be involved in the potato starch project too please. Here’s a link to an Italian organic olive oil that is available in the UK. The quality and taste seem very good to me as a layman, but would be interested to have it confirmed as part of any future review of oils. I thoroughly enjoyed the book. There is a probiotic that was developed with the help of the University of Queensland called Perkii. The bacterium used in the probiotic is lactobacillus casei (Lc431). Perkii calims to use technology called Progel that encapsulates the bacteria which it allows to pass through the small intestine unaffected and it passes to the lower intestine and colon. This raises questions to me. Have you heard of this? How “good” is the bacteria used? I’ve included a link to a pdf about the product. Hello. Loved the book and very keen to get started. And would esp be interested in the potato starch experiment please! Am also keen to have gut analysis, but uBiome and British Gut seem to require the input/collaboration of a GP. Is that correct?? Thanks. I think more care needs to be taken with the recipes. The pictures of some are clearly not the recipe quoted, for example the Green Brekkie Bowl which shows chillis, not in the recipe. The methods of cooking are sometimes not clear – for example grilling a Portobello mushroom for 3 minutes does not work – in my grill anyway. Maybe mine are too large. I do find I have to amend many of the recipes though after a near disaster trying to make them like the ones in the app. Having said that, I love them although could do with more non-meat ones. I particularly love the courgette fritters. I had made Seeded Soda bread and it was a disaster the omount of liquid is clearly not enough as the dough was still very crumbly I did add more fluid but it was not a nice bread. Also I am now in the process of making No-Knead Sourdough and low and behold it says to add Salt but there is no salt in the ingredients!!! So how much is one supposed to add? Michael – you write about Pia’s work regarding seaweed capsules and how they helped a lady with psoriasis. I have palmar/plantar psoriasis and methotrexate is the only method of control which works for me. I would like to trial the seaweed capsules. When will Pia’s study be published and is it possible to obtain the seaweed capsules? I couldn’t find this information on your website. Thanks. I’m part way through the book and am very interested in the potato starch survey. I have not yet done any research myself on this, but interested as I have some issues with sleep. I use melatonin daily. We do intermittent fasting, eat healthy, use turmeric and supplements. I would be happy to provide you with more health and lifestyle details if required. Thanks for the books and videos which are extremely informative and helpful and quite fun to read. Hi, can anybody please explain the link to me between HIIT and the Biome? Having read the book i am a little disappointed that there was not any strong evidence given other than that a there is a rugby team who do hi intensity training, eat a varied diet and have diverse microbiome in their poo. There was no theory put forward as to why the author thinks there is a link here or the possible mechanism of how this works to positively impact on the biome. Not that i am doubtful of the benefits of HIIT at all, just interested from a scientific point of view. I felt it was the only thing that didn’t really tie in as well as everything else in the book which was otherwise a very good read. thanks to anyone who can reply. HOW MUCH SALT IN SOURDOUGH? Heron- 1 and 1/4 teaspoons salt in sourdough- I got in touch with The Wild Baker mentioned in recipe header! So it seems that fairly vigorous exercise up to 60 minutes a day would be beneficial. Marching for 10 hours a day, four days in a row on skis with weighted backpacks not so much! @pigcalledegg You’re welcome! I should note it does say it progressed to “vigorous exercise” so maybe that would cover HIIT. A quick google of high intensity microbiome brings up quite a few studies that indicate it is beneficial. From Australia, I have searched high and low on the internet today looking for christensenella tablets, which in the book page 58 says you can purchase on the internet. I’d like to know where we can purchase these tablets. Would they be under another name perhaps? Has there been any update on the brands of Olive Oil that are best to use? I’m in New Zealand, so looking for a brand available in this hemisphere! I am enjoying trying out the diet. I do have 2 questions. 1 I would also like to lose weight and am not on this diet. Should I try the blood sugar diet instead? 2 I get quite strong facial eczema when I drink Kombucha and/or the milk kefir. Is this a common reaction to the bacteria/yeast? Will it go away if I continue to do it?